This beautiful calendar is the perfect tool to explain and understand the concept of time and timekeeping of the ancient Maya. The discs are on a plywood base, which is 32 cm in diameter, the outer ring is 31 cm in diameter, so the base just overlaps at the edge to provide protection. The central disc is fixed to the base and the other four rings rotate around to line up with the numbers, days and month glyphs. The calendar is lightweight and easy to use. 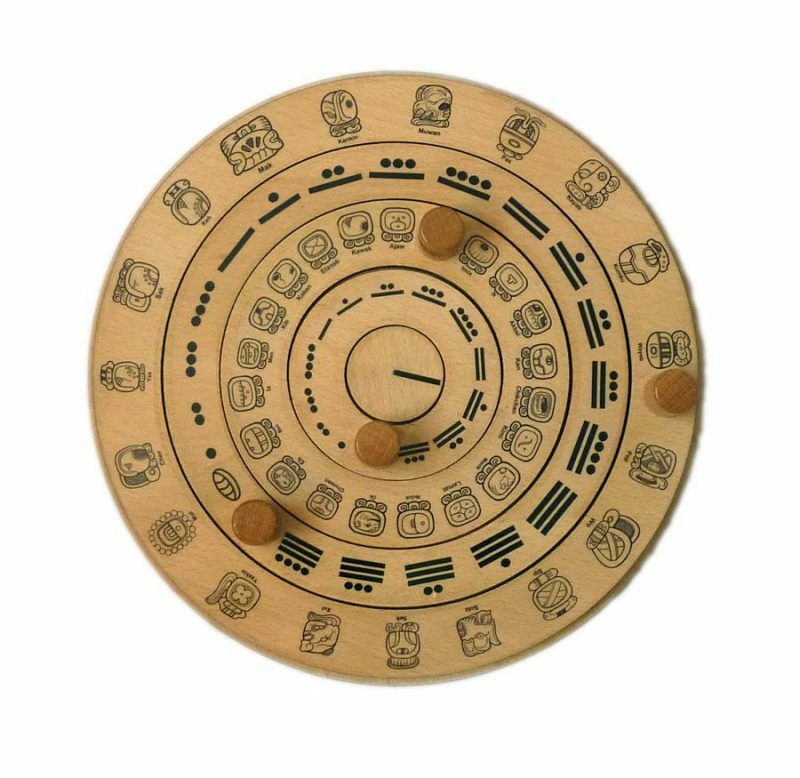 Use the knobs to rotate the rings and work out a date in the Maya calendar! Time was extremely important to the Maya, every inscription began with the date and their precise calendars greatly aided their astronomical recordkeeping. The Maya calendar round of 52 years, consisted of two cycles. The first is of 260 days (Tzolk’in – the sacred year), which has 1 to 13 numbers and 20 named days, e.g. 1 Imix, 2 Ik, to 13 Ben. The sacred year then was made up of 20 months of 13 days. The second calendar was the 365-day solar year (Haab), which had 18 months of 20 days each, with 5 days added to end. For example, 0 Kimi would be followed by 1 Kimi, then 2 Kimi, up to 19, then it would be 0 Manik’, 1 Manik’ and so on. For example, if today is 1 Imix, 3 Sip, what will be tomorrow, oy yesterday or next week? Using just the first two rings (the sacred calendar), ask your class to ake their own prophecies for each day. For example 1 Imix it will rain, 2 Ik is a good day to plant seeds and so on.